Photograph from the Curzon Collection, of a building in the Ram Bag at Dig, Rajasthan, taken by the studio of Priyalall & Company in c.1900. The beautiful 18th-century garden palace of the Jats of Bharatpur at Dig was built by Badan Singh (ruled 1722-33) and his son Suraj Mal (ruled 1733-63). The palace consists of pavilions arranged around a formal garden filled with fountains which was laid out in the Persian-Mughal tradition of the char bagh and flanked by tanks or reservoirs. The Ram Bhavan is a pavilion on the north edge of the complex, and the Ram Bag may the garden adjacent to it. In the foreground of this view is a baradari or square, open, columned hall overlooking a pool. 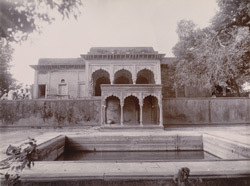 A second baradari forms a portico to the pavilion behind. The deep projecting cornice supported on carved brackets is a distinguishing feature of the palace architecture at Dig.